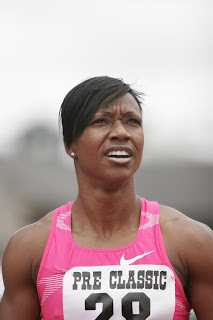 MIAMI, Fla. — World 100-metres bronze medallist Carmelita Jeter will attempt to break the world record for the 60m dash during the indoor season next year, her agent told World-Track on Wednesday. Championships in Doha in March. She also clocked a flashing 10.67secs prior to her personal best. Block added that there are no specific meetings on the radar just yet, but confirms that they are a lot of possibilities for her to race in the United States and in Europe. “She has not set any specific meets yet, but we are in talks with several promoters in the US and Europe,” he said. In the 2009 season, Jeter improved her personal best to 7.11secs, but is clear a hot favourite to better that performance in addition to posting a strong challenge on Russian Irina Privalova’s long-standing 6.92secs world record.